A new office building is on tap for a part of town booming with new apartment towers and cranes. 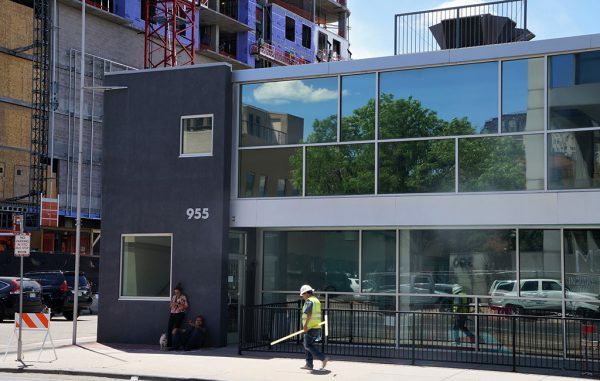 Denver-based Alpine Investments expects to close on the purchase of 955 Bannock St. in the Golden Triangle with plans for a 10-story structure. Managing principal Churchill Bunn said the building will have 65,000 square feet of office space across its top five floors. The ground floor will have about 1,200 square feet of retail space in addition to the building’s lobby. The four floors in between will be parking. “The Golden Triangle needs more office to round out the neighborhood,” Bunn said. The 0.36-acre lot is home to a two-story, 9,300-square-foot structure that dates to 1982, according to city records. It previously housed coffee shop Rooster and Moon, which closed in September 2016 after eight years, and cafe Anecdote, which moved out last month. Tenants still use the building’s office space. Bunn said Alpine would buy the property for $3.1 million from owner Bannock RE Partners LLC, which paid $2.9 million for it in February 2016. Bunn said he knows a member of Bannock RE Partners LLC, and reached out after the 2016 sale to discuss the possibility of redeveloping the property. “We’re surprised there’s not more office being built on the south side of downtown because it’s so accessible,” he said. Alpine hopes to begin construction in October and deliver the building in the fourth quarter 2019. No tenants have committed to the space yet, Bunn said. Pinnacle Real Estate brokers Blake Holcomb and Jeff Caldwell are handling the office leasing. Hyder Construction is the general contractor and Gensler is the architect. The 955 Bannock St. parcel is surrounded by the multifamily development for which the Golden Triangle has become known. South of the lot, Houston-based Greystar is building a 16-story apartment complex with more than 300 units. The five-story vacant structure across the street, meanwhile, was purchased by Lennar Multifamily Communities, which paid $18.5 million for it and a large adjacent parking lot. Lennar has submitted project concepts to the city proposing two apartment towers. Alpine has two other projects underway in Denver. Last fall the company paid $3.85 million for the shuttered private school at 2949 N. Federal Blvd. and began converting it to office space. It’s also about to break ground on a condominium project at the corner of 17th and Central streets in LoHi.